When we were invited to an advance Fox Searchlight Pictures studio sneak peek screening of the new fall film, Battle of the Sexes, starring Emma Stone and Steve Carell. Wow, what a time machine trip back to the hippie dippie 70’s that seems more like a time warp than a dewy-eyed look at the past. 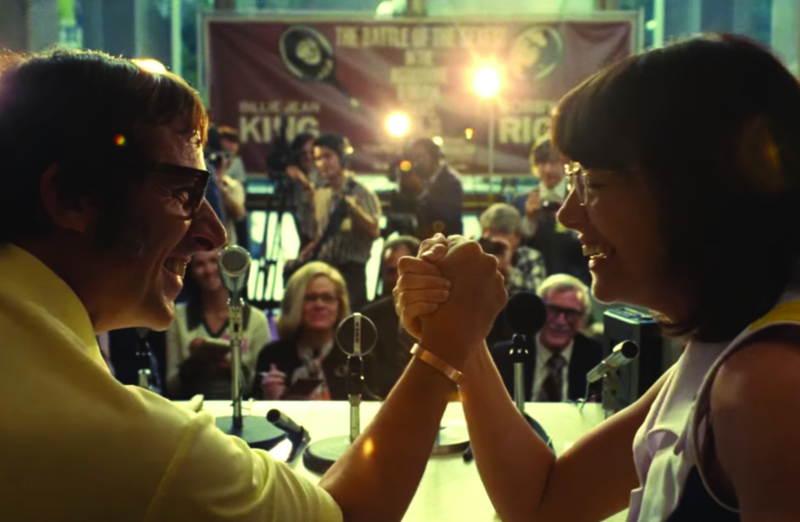 In the wake of the sexual revolution and the rise of the women’s movement, the 1973 tennis match between women’s World #1 Billie Jean King (Emma Stone) and ex-men’s-champ and serial hustler Bobby Riggs (Steve Carell) was billed as the Battle of the Sexes. It became one of the most watched televised sports events of all time, reaching 90 million viewers around the world. The match took place at the newish-at-the-time Astrodome in Houston, so the Texas ties to the film were robust. The 70s-specifc era is lushly and accurately captured in the film with a sort of olivey-harvest gold tint that permeated movies that decade. As the rivalry between King and Riggs kicked into high gear, off-court each was fighting more personal and complex battles. The fiercely private King, who you really root for since the flagrant inequality is in every foot of film) was not only championing for that equality, but also struggling to come to terms with her own sexuality, as her romantic friendship with Marilyn Barnett (Andrea Riseborough) developed. And Riggs, one of the first self-made media-age celebrities (the original reality star without a TV show), wrestled with his gambling demons, at the expense of his family and wife Priscilla (Elisabeth Shue is still 80’s era dazzling without any plastic surgery refreshing). Together, Billie and Bobby served up a cultural spectacle that resonated far beyond the tennis court, sparking discussions in bedrooms and boardrooms that continue to reverberate today. The attitudes might seem shocking 40 years later in retrospect, but it’s a strong barometer of how far we’ve come, baby, to use vernacular of the day. Even Howard Cosell’s shrill reincarnation (thanks CGI) as the tennis match color commentary expert makes one cringe at the off-handed sexist remarks that ran rampant during the three-hour spectacle then. Sarah Silverman does a wonderful supporting star turn as the women’s team coach who strikes an annual deal with Virginia Slims cigarettes to sponsor the tournament when the women are forced to resign from the mixed league due to the pay inequality. Run, don’t walk to see this film and take it to heart with all the heart it took to make it and how it shares a relevant message for these politically charged times. It’s worth another look back to right the wrongs done to our mothers’ and grandmothers’ and their generations.